A lot of the glamor in the technology world shines on the fabled Silicon Valley startups. You know, brilliant young people, huddling over their laptops coding night and day, and coming up with Snapchat. Or Instagram. Or Angry Birds. 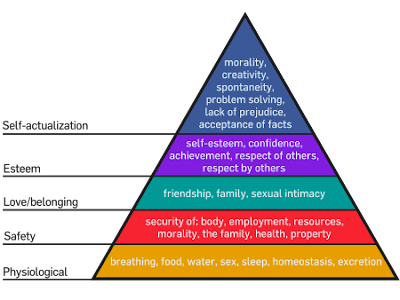 What is the common denominator for that startup world? It's directed at the consumer market, and most likely, to the goal of being acquired by a bigger company for a LOT of money. What do they have in common with the enterprise CIO, and the needs he or she faces every day? And why does it seems as though most of that precocious startup talent is focused on the consumer space? That is a story in itself, and I'll tell it through the example of an exception to the "startups are only interested in consumers" idea. uGovernIT is an ingenious startup, based in greater Los Angeles. It challenges that conventional startup thinking by aiming directly at the pain points faced by C-level executives in the enterprise. Even more specifically, they are going after the midmarket segment of the SMB space. uGovernIT is "ERP for the CIO," an integrated suite of IT management functions delivered through a web browser. Founder Subbu Murthy sees an opportunity to bring the same kind of disruption to enterprise applications that consumerization of the enterprise has brought to the workplace. Although uGovernIT works with larger enterprise deployments, the focus is on the mid-market--a standalone product that is completely functional in a smaller enterprise even without back-end systems in place for functions like project management, portfolio management, and resource allocation. In common with consumerization of the enterprise products, uGovernIT is quick to deploy and does not require extensive configuration or infrastructure investment. Another powerful lesson uGovernIT takes from consumerization: you can drive quicker time-to-value in business IT by simplifying and standardizing processes while allowing some customization at the user level. I can bring personal experience to bear on this commentary, too. As I've written in previous posts, since moving to the bay area in 2013, I have worked in the retail space at both a national chain of about 100 stores and at a much smaller lifestyle operation with a website, a couple of retail locations, and 2 restaurants. In my stealth retail analyst role in each of them, I was astonished to see the difference in the IT approach compared with a Fortune 500 company. Specific expertise is rare, ability to innovate is almost nil because so many resources are devoted to keeping legacy tech going, and purchase decisions are made by people with almost no knowledge of the bigger technology world. If any marketplace is ripe for disruption, it's the midmarket and its beleaguered CIO. Surely a web-delivered app that gives smaller companies low-cost access to enterprise-grade services like workflow, analytics, and project/resource management would be a huge draw. But it's not as simple as "build it and they will come." I was introduced to Murthy by a colleague at a major research firm; the uGovernIT startup is not itself large enough, or the recipient of enough analyst coverage, to warrant coverage yet by IDC, Gartner, or Forrester. But my analyst colleague still saw the value in Murthy's work, and suggested that he and I talk. I've spent several hours in conversation with with Murthy and his CIO John Grunzweig. 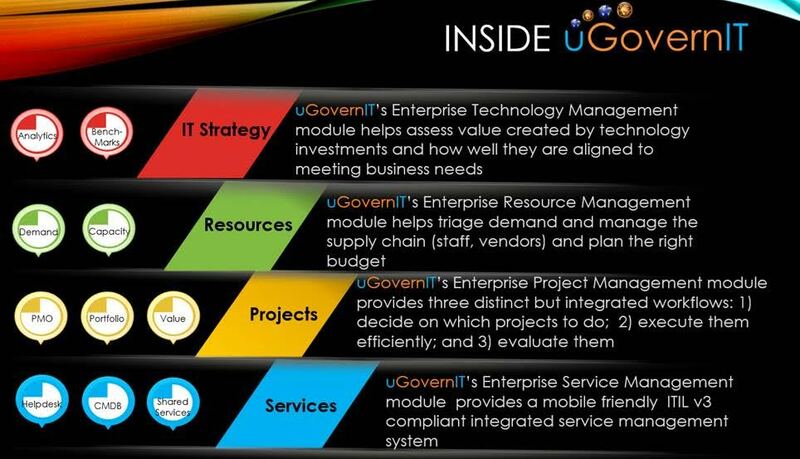 uGovernIT is a fine offering with a clearly defined market. It's definitely a sound business model. And as detailed in part 2 of this report, it reflects some important emerging technology ideas you've read about on Infrics.com for several years. Infrics: Tell me about your decision to develop uGovernIT. Why this product? Why this market? "As a CIO, I felt that CIOs did not walk the talk. On one hand, they would be recommending analytics and business intelligence, but they were not practicing it. The reason was not that they were not smart, but they did not have the tools that they could afford. The mid market could not afford the kind of tools their big brother could. 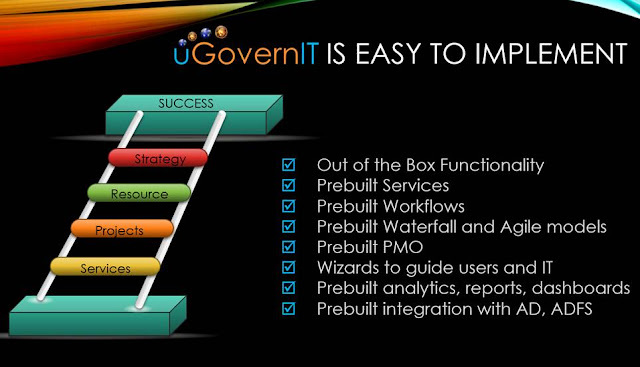 So uGovernIT was formed to provide a one stop for all tools needed to manage IT." --Your product is live and your team is dealing with sales and with clients in the field. What lessons have you learned about the decision to develop for SMBs instead of, say, a potentially lucrative mobile app for the consumer space? 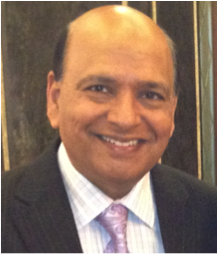 "Perhaps, my motivation was driven by my experience as a CIO in mid-market firms. Money is a by-product and not a goal in itself. So when I saw a need and most product firms were only focused on the big companies, I decide to invest and develop a tool that was easy to use but with great utility." --Are clients revealing new markets to you based on the way they respond to the uGovernIT "ERP for CIOs" concept? "That is a starting to happen. Our entry into the construction vertical is derived from the need for dynamic resource management that connected the resource supply to demands." --You mentioned to me once that it's not just developers who seem fixated on the consumer market, but that the venture capital community has been challenging for enterprise-directed startups. What message would you like the V.C. world to hear about enterprise products? "Great question. My message to VCs is consumer products have pizzazz and the lure, but enterprise products are critical. The shift from just being an Analog enterprise to Digital is well on the way. The case study shared by CIO Magazine (November 1, 2015 Issue) provides insights into how IOT (Internet of Things), analytics and the mobile platform have enabled Michael Nilles to embark on a journey where technology and core business of Schindler (elevators) are inseparable. The existing enterprise systems need to be disrupted with totally different systems. For example, action centric systems will replace data centric ERP. I feel what we are doing to IT management, there will be disruptive technologies that will render SAP, Oracle expensive and irrelevant." --After I spent a couple of hours in a product demo, it seemed to me that the sweet spot for you in the market is a firm big enough to need ERP-like functions, but not so large that they have already invested in spot solutions. As a former CIO yourself, will you talk a little about the integrated approach you've chosen? Do you see your offering as more of a "one integrated solution" or as an integrated front end for systems or business processes that companies may already have in place? You are right on the money. While our tool is marketed as a one-stop complete solution, we can be the front end tying things together for firms that do not want to change transactional systems. For mid-market with a solution, the one integrated solution probably applies, but for larger firms they want to probably retain the point solutions, therefore, the integrated platform which can tie things together is a good metaphor. --Talk to me about the architecture of uGovernIT. I'm specifically thinking about the use of a well-liked backend in Microsoft's SharePoint as a starting point. What are the implications for you as a startup, and for your customers as a "you already trust this program" sales point. While our platform supports multi-tenant models, we felt that most mid-market companies are tied into Office 365 and SharePoint. This is why decided on the SharePoint approach. That said, we only use SharePoint for content management and access, but we have our own workflow and analytics engine. --I asked earlier about your message to V.C.s What insights do you have for those considering developing for the enterprise market? 1. Know your market. I was a CIO for several years before I could embark on this product. 2. Have a target customer. I had three adopters even before I wrote a single line of code. 3. Have good mentors. I had over 20 CIOs who guided me. In part 2 of this report, we'll examine what uGovernIT does, and how it aligns with classic Infrics.com themes like stateless computing and complexity management. Google: Skype, Photoshop, Office and every Android app on Chrome OS. In the second month after Infrics.com went live in 2011, I switched my primary computing platform to Google's Chrome OS. As I've written, I believe it is the best expression of the major trend I've labeled "the stateless future." Time has proven the accuracy of that prediction. Chrome OS devices now outsell all others combined in the education market; in Q1 2016, IDC Research reported that Chrome OS has now overtaken Mac to become the second most popular PC operating system. Enterprise penetration of Chrome OS is accelerating, and for good reason: incredibly simple deployment and management, excellent built-in security, plus dramatically lower cost of acquisition and TCO. Every Android app will work offline, eliminating one of the last excuses not to deploy Chrome OS. This includes movies, music, photos, and the entire range of business applications in addition to games. The architecture runs a version of Android in a container within the existing Chrome OS shell, and it is fully integrated into Chrome OS standard features like notifications. This is "the other shoe dropping" after the organizational change at Google that brought the Android and Chrome OS teams together. Chrome OS is not going anywhere: Android's next release will adopt the seamless behind-the-scenes update system that Chrome OS has always had, and Chrome OS will add almost all of the Android app and feature set to the laptop and desktop. Part II of "The future? I've got this." Business and technology are now partners; the future of each has a profound influence on the other. 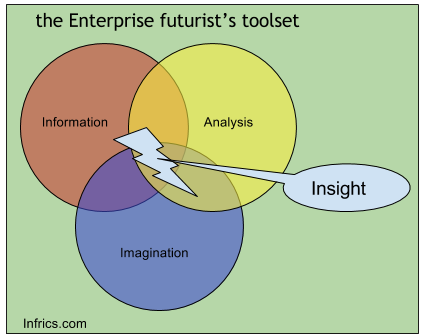 In the enterprise, that means that futurism's importance is magnified. It's no longer some abstraction that can be casually passed over because it's too nebulous. 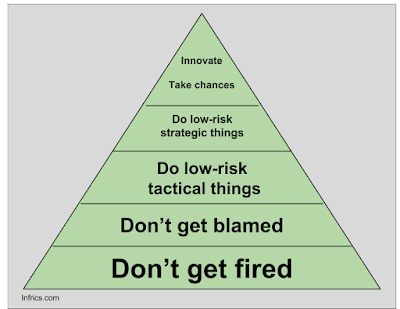 Thinking realistically about the future should be in your arsenal for both strategy and tactics. You can do it, and do it well, but like any business function, you need tools and methods to give structure to the effort. That's what this series is about. In part one, I tackled one of the most difficult concepts, cultivating the ability to imagine the future. Close behind imagination in difficulty is the skill to pick out important information, to analyze information and figure out what is really important. Humans have always been a technological race, but rarely have we been faced with so much technological change, such a rapid pace, and such a downpour of news and opinions. The challenge? Seek out the right information streams, analyze them to figure out what is important, and imagine what that knowledge means for the future of your enterprise. The result: actionable insight. I'm writing these articles as thought pieces, and as planning chapters for a workshop on enterprise futurism. As the ideas take shape on the screen, one thing I've quickly seen is that the structured exercise of futurism extends beyond just a few blog articles. So let's stay within the bigger Venn diagram of the futurist's toolset, and lay out the first series of ideas about information importance triage: analysis. Get away from your professional peer group and ask them to think about the same ideas. Oftentimes, someone who is totally uninformed about the realities of say, supply chain, will not have preconceived ideas about the possible, and will be more free to think without limits. Try asking yourself, "am I far enough away from this to see it clearly?" Oftentimes, this 3rd party approach adds a degree of clarity: the forest, rather than the trees. 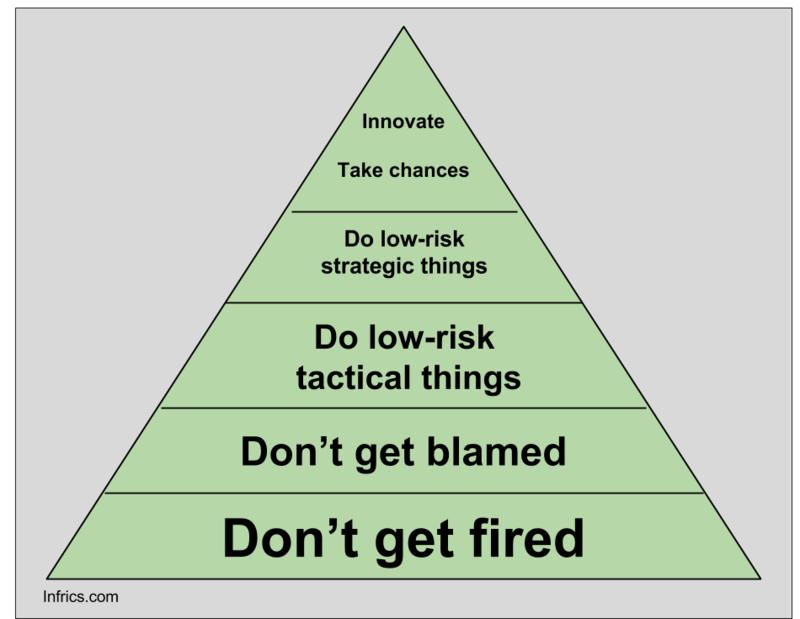 Action item: don't just think about this concept horizontally, from your own position as an IT executive or manager. Go vertical, and seek ideas from your front line in retail, sales, and manufacturing. Go to other internal horizontal constituencies. Look for patterns that are in play. Will they continue at the same pace, or will they accelerate or decline? --In the 50s and right up about until the first moon landing, a lot of "the future" was about getting places faster: interstate highways, jet planes, rocket ships. But all of a sudden, the laws of physics and economics caught up with the tech advances, so we've been almost stagnant in transport speed since 1970. --The real tech revolution since then has been about communication and social connection. Did either show up in the era in which everyone was preoccupied with "faster, faster?" Not very often, because they were asking questions about the status quo future. What big change pattern are we missing now, and what of the "now" will continue to change rapidly? Action item: It's easy to get trapped in the idea that current rapid changes will keep up that pace, but emerging changes in other areas that can be meaningful--a major opportunity source. Does the tech news you're seeing really reflect a change in an area that is still accelerating, or something that is nearing the end of its fast rate-of-change cycle? Related, but separate, is the idea of democratization. We may not be flying or driving faster, but aspects of transportation that were once the reserve of the wealthy are now cheap and widespread: "jet set" doesn't mean much when families in sweats are boarding on cheap flights, packed like sardines, and paying for bad prepackaged sandwiches. "Long distance phone calls," which once were something an executive used for big business deals due to the cost, have become an irrelevant concept when global voice communication is essentially free for everyone. Those are not technological changes, but technology was an important trigger. Action item: what does it mean to be wealthy today? What does money buy you that has not yet been impacted by technology democratization? What is now the province of the rich that may be democratized as artificial intelligence becomes more sophisticated and widespread? These analysis tools are not themselves about technology at all, one more reason that your examination of the future of technology will be more successful if the participants are from all lines (and all levels) of your business. Think of each as a lens through which to evaluate technology news; discussion of the emergence of clickbait and the never ending news cycle is the subject for another post in our "The future? I've got this" series. part 1 of "The future? I've got this." The future. It looms out there, like a fog, hiding business opportunity and threat in equal measure. When you're in the enterprise, some days it seems the fog is even thicker for all the vendors, analysts, and news sources predicting what will happen. How do you sort out what is important in ways that can help you make smarter decisions for business? Making smart predictions is a learned skill. Anyone can make better predictions. You can catch disruptions earlier than you do now, or you can identify trends in time to be disruptive yourself. I want to start with imagination; it's not only rarely used in business, few seem to believe it's something you can learn. "You either have it or you don't," is common to that discussion. No. Business imagination is also a learned skill. In this post I plan to demonstrate that the very act of adding structure--learning methods to improve imagination--can free your mind to explore in imaginative ways. "the creative imagination works best when faced with explicitly understood constraints," say Michelle and Robert Root-Bernstein, in their 2009 article in Psychology Today. With that idea, we can let go of the crystal ball concept of futurism, and move to familiar-territory business. Start small. Don't try to imagine future scenarios at the big picture level, especially when you are mastering the art of rule-assisted imagination. Later on, any number of these small-scale exercises will form building blocks of that big picture, but for now, chose one idea at a time. Pick a specific idea. Here's an example. Take something about emerging technology that seems to be true, in this case "wireless connections will likely be more reliable in more places, with higher bandwidth, at lower cost." Now, pick just one aspect of business, and imagine possible impacts of that statement. How about supply chain? Now you can ask a "what if" question and begin imagining possible outcomes. Tease out that future; try thinking from the standpoint of manufacturing, distribution, and retail. See what's happened? Imagination has gone from the nebulous to a structured what-if situation. One of the huge drivers of the personal computer revolution was the Visicalc spreadsheet, which transformed cumbersome financial what-if questions to something that could be done every day. Once it's easier to ask such questions, you're free to imagine any number of futures. Work alone at first, and be fearless. With few exceptions, group-think kills imagination. It's killed by fear of appearing foolish, need to seek consensus, and the tendency of more outgoing individuals to dominate the conversation. Later on, you will get together to talk about imaginative ideas, but in order to work the imagination plan, you want to start just in your own head. Fantasize. This can be one of the hardest steps. To really use imagination, we've first set some constraints; now, within those limits, that scenario, imagine that which seems impossible. Staying within the story started above, here's an example of one future: wireless, available at previously impossible speeds, universally available anywhere in the world, and so cheap as to be free for all practical purposes. It overlaps into the current excitement about the internet of things. What if every person, object and process in your business had access to this connectivity? Not only is this likely within the near future, we already have a parallel in long-distance telephony. Free long distance, anywhere in the world? Never happen. Oh, wait. So here's a future to imagine: connect with anyone or anything in your business world at any time, any place, and exchange unlimited information for free...where can you go with that in your company's supply chain? Run with it. 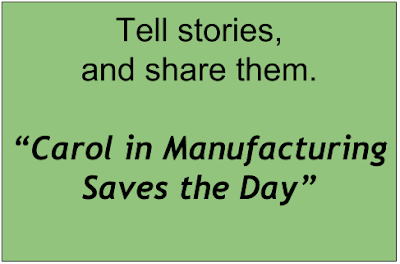 Tell stories about the future. Then share them. By now, there's a good chance some excellent and imaginative ideas have begun to appear. In order to bring the still-nebulous concepts into focus, make up stories in which that reality is a central figure. 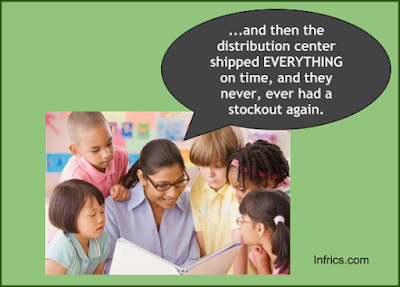 "A Day in the Life of a Distribution Center," "Carol in Manufacturing Saves the Day," and so on. Storytelling gives imagination a structure upon which to build, to feel real. Here is an example of a way I used storytelling to describe a future with artificial intelligence-minded Personal Digital Assistants. Although I encouraged you to work solo when you're setting your imagination free, it's in the sharing of stories where excitement begins, you get some really cool synergies, and the first sense that some imaginative ideas will get traction. Just don't let those sparkly personalities on your team (and every meeting has them) take the limelight from more introverted members. Everyone here has something useful to contribute. If it's hard to be fearless when you're alone, it's even more so in a business meeting. It's the leader's responsibility to nurture a place where everything is open to discussion. The important thing here is to fire imagination, not to be right. In business, it's really, really tough to let go of the idea that "I have to get this right." In fact, it's in the getting it all wrong--totally different--that imaginative genius flourishes. Really, we're going about this out of order; imagination actually follows information gathering and analysis, but it's important to enter the futurism process with these imagination concepts in mind. They will help you do a better job of information and a better job analyzing what you find. And there are structures for those as well. That's in the next installment. I've argued before that subjective information is among the most important measurements of the success of emerging technology research, and that you can add subjective data into a metrics stream by assigning number values to subjective ideas. It's a great concept, one that is not often given much weight in enterprise metrics. I recently hurt my back at the gym, and got a referral to see an orthopedist. Among the very first things in our discussion was the question, "how much does it hurt on a scale from one to ten?" "Well, it's an 8 when I have a back spasm, but just sitting here right now talking with you, I'd say it's a 2 or 3," was my answer. That discussion is a practical demonstration of applying hard numbers to subjective feelings as a way to benchmark them. It's not touchy-feely at all, and it's surprisingly practical. And in that conversation, we have an important lesson about the way we measure performance within our enterprises, and how Google applied numeric values to subjective data to find out why some teams succeed and others don't. After exhaustive number crunching about teams that worked really well, one of the main findings was that all team members need to have a sense of what they call "psychological safety" within the team. In successful, high-performing teams, all members feel safe to offer any contribution without fear of ridicule or reprisal. "The data helped me feel safe enough to do what I thought was right,’’ is the concluding quote in the NYT story. Let's take this away from the idea of just talking about feelings. 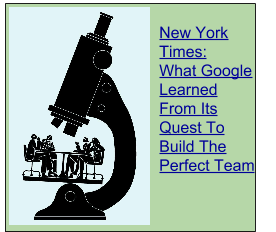 As Google's research bears out, feelings turn out to have measurable value for enterprise success. But the goal to get value-add from subjective data goes much farther. When it comes to perceiving nuance and big picture--as opposed to big data--there is still no more powerful computer on earth than the human brain, and you have them in your organization in abundance. Unfortunately, because it's tougher to report nuance as a hard number, it's relegated to the "subjective, hence unimportant" bin. We already have historical evidence of subjective input outperforming choices based upon pure datasets: crowdsourced stock predictions. Here is a practical example of measuring subjective data in business. At each stagegate of your projects, ask participants to report their sense of the project: "on a scale of one to ten, how do you feel about this project's likelihood of success?" A caveat, though: unless you have made giving an opinion openly a safe thing to do*, the data you receive is likely to be highly biased. Anonymity through a third-party survey site might be in order. Average the results, chart it over time against your other KPIs for the project, and I don't think it will take very long to get a very useful Project Health Index that you can benchmark against variables within the project management, and against other projects. That is an early warning system, a business metric you can take to the bank. By the way, my back is doing better. Occasional incidents of a 5 or so, but the trend is good. *The whole topic of "safety in reporting" is profoundly important to business metrics. I'm at work on a subsequent article on the idea, and will report steps former Ford CEO Alan Mulally took to change the fear culture that used to permeate Ford.